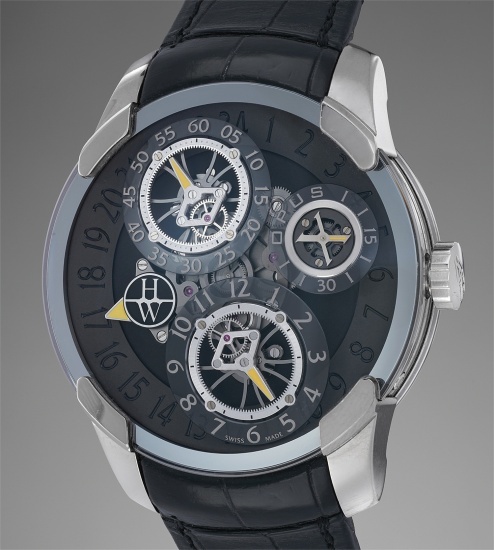 To create its tenth Opus Harry Winston turned to Jean-François Mojon whose name is not a familiar one but whose company Chronode is behind the creation of movements for the likes of IWC, Czapek, MB&F or Urban Jurgensen to name a few. The same year the Opus X was introduced, Mojon was awarded the best watchmaker (meilleur concepteur/horloger) prize at the Grand Prix d’Horlogerie de Genève (GPHG) in 2010. There is something quite mesmerizing about the dial side of this timepiece. Its complexity is evident and even though there is no astronomical complication in this watch there is something quite cosmic about it. The latter is underlined by the continuous rotation of the different indications on the dial. Three slightly inclined subdials with numerals printed on a surface made of sapphire are mounted on a central revolving frame that makes a complete rotation in 24 hours. Each subdial indicates either the hours, minutes or seconds and rotates within the central frame whilst, the hands within the subdial also rotate ensuring orientation remains constant in any position. A yellow tipped hand indicates a second timezone on 24 hours. Where the dial side represents a highly complex mechanism, the backplate of the movement is surprisingly traditional, beautifully hand decorated with Geneva waves and delicate bevels. The 72 hours linear power reserve indicator and ruthenium plating of the components add a highly contemporary flair. A surprising timepiece with much more than meets the eye as there is a certain poetry in watching the rotation of the dial and all the elements within. Limited to 100 pieces the Opus X is a watch like no other and a technical marvel that would please the collector of extraordinary timepieces.